yes I am the server admin. I used the privilege key. should I try using it again? Last edited by florian_fr40; July 16th, 2011 at 11:14 PM. Read the top of this thread. Only 2 tabs in Server admin Permissions? I'm MrCPU, I am a Server Admin on my teamspeak server, I've used a privilege key to get that and it was successful and so I go into "Permissions" then into "Server Groups" and there is only 2 tabs up the top "Server Groups" and "Channel Groups" when there should be 5 tabs; "Server Groups", "Channel Groups", "Client Permissions", "Channel Permissions" and "Channel Client Permissions". But there's only 2 of those 5. So Please respond and tell me what to do to get the other 3 back. Last edited by florian_fr40; July 23rd, 2011 at 11:33 PM. Hello I just setup a fresh server and I noticed when i go permissions than click server groups this box that shows up is not what I'm used too seeing. How do I set all the other permissions btw I'm running this server on Ubuntu an I picked the 64bit linux server release the permissions window im looking for was the one the original video. Last edited by dante696; August 3rd, 2011 at 02:28 PM. I'd like to know how to set permissions for clients and for channels! Last edited by florian_fr40; August 3rd, 2011 at 08:52 AM. Last edited by StarGalaxy[Superman]; July 30th, 2011 at 08:45 AM. i set a Client Icon to many Clients but in the latest version the permission system change and now i cant edit the client settings. how i can delete or change client icons who? is there a way to change client permissons? Last edited by florian_fr40; August 14th, 2011 at 05:56 PM. When I follow the guide, I have a completely different interface to the one shown at 3:10 and none of the options it has. Is this because the video is outdated or is it something to do with my admin account? I have been able to see that all of its permissions values ate at 75. Should they be 100? Is there actually a way to change the numerical permission values for server groups and how do I do it? I can't find any useful guides and ClanForge's support service has been useless. Last edited by florian_fr40; August 25th, 2011 at 07:52 AM. Umm yea im having this problem when i goto Server Groups i dont see the Filter Text Box....so i cant edit the things i need to edit, such as "b_virtualserver_channel_list"... Please Help Heres a ScreenShot,,. 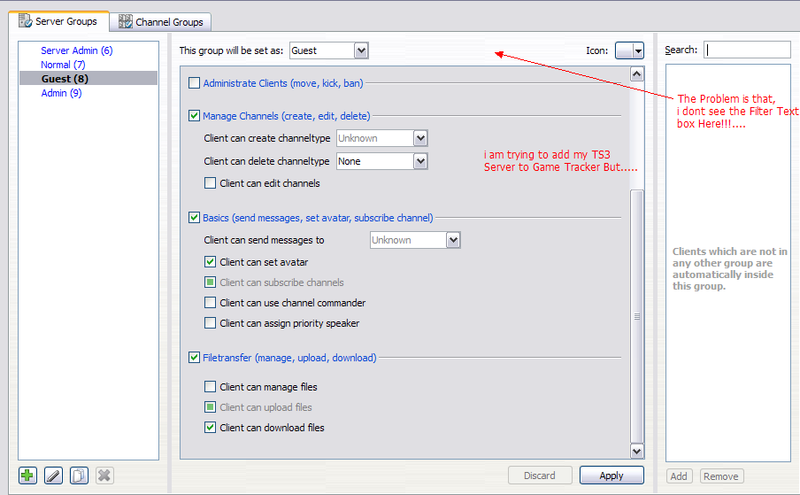 1. im not allowed to change so serveradmin shows as rank as then it gives me the error and aborts: "you are about to remove grant permissions for a server admin group and you are a member of it"
Hi i cant find where to change my permissions values like its shown on this picture and like its shown in the Ts3 Tutorial. Last edited by florian_fr40; October 8th, 2011 at 10:51 AM. i just got the highest rank: Server Admin. With this Rank you can see every rights in the rightsmenu. But, everyone with the same right (Server Admin) can see those available options. Everyone, but me. I only see the first two. Servergroups and Channel Groups. Is there something special ? Some new functions where i can switch the design or something like this? Thread merged, please look at the top of this one.